He’s also hard at work at another game, presumably horror-themed, as well. I’m hoping to have something else in addition to it, but it may not be ready. I have something fun in mind, a new game (not FNaF5), but it will be a real challenge to have even a small playable portion by Oct 31st. If a playable demo isn’t ready by then, then at the very least there will be some sneak-peak content. His final comments may be the most interesting ones, though. Key to Five Nights at Freddy’s success has been the pieces of story deeply (and cryptically) embedded in the games. Fans have obsessed over trying to piece together what’s really happening in Cawthon’s creepy universe, and the designer was constantly surprised at how quickly people were able to put it together. 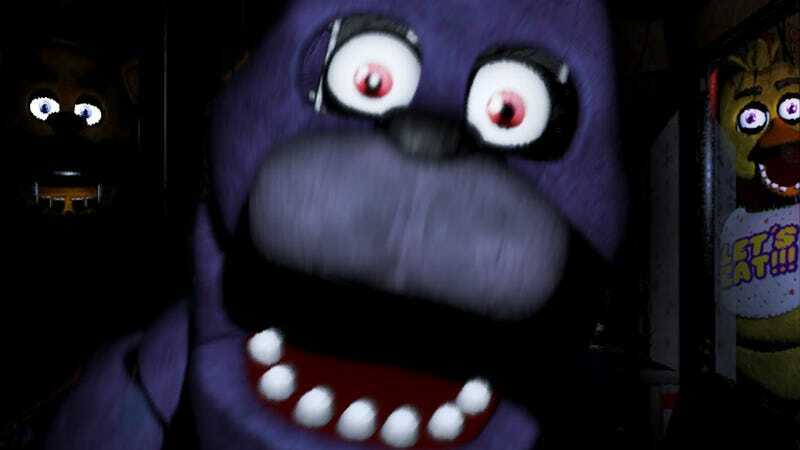 With Five Nights at Freddy’s 4, however, he’s a little disappointed. I released part 4, and somehow.... no one, not a single person, found the pieces. The story remains completely hidden. I guess most people assumed that I filled the game with random easter eggs this time. I didn’t. What’s in the box? It’s the pieces put together. But the bigger question is- would the community accept it that way? The fact that the pieces have remained elusive this time strikes me as incredible, and special, a fitting conclusion in some ways, and because of that, I’ve decided that maybe some things are best left forgotten, forever. See, Cawthon had been considering opening “the box” with the Halloween update. The box? This shows up at the end of Five Nights at Freddy’s 4, but no one knows how to open it. It’s remained a total mystery since the game came out earlier this month, and since the community hasn’t (according to Cawthon) deciphered the game to his satisfaction, he may keep this locked. Now I want to talk about what WON’T be included... the box. You know, when I released the first game over a year ago, I was amazed at how quickly everyone found every bit of lore and story. Then the same happened with part 2, fans and youtubers dug in and found everything. Game Theory did an incredible video on part 2; getting almost everything right. Then part 3 came out, and once again the story was uncovered by the community. It seemed that there was nothing I could hide! My guess is he’s trying to light a fire underneath the community to do some more work, but who knows? Maybe he’ll keep the box closed, infuriating fans who want to know all the answers.